In an advisory late Tuesday, the organization said it has noticed "a pattern of disturbing incidents reported by African-American passengers, specific to American Airlines." It said the incidents "suggest a corporate culture of racial insensitivity and possible racial bias" and advised travelers to exercise caution. "Booking and boarding flights on American Airlines could subject them [to] disrespectful, discriminatory or unsafe conditions," the advisory said. 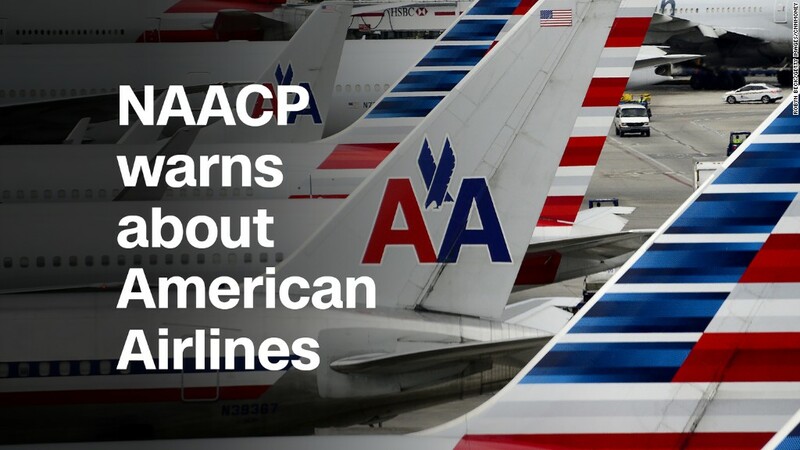 American Airlines (AAL) CEO Doug Parker said in a memo to staff that the company was "disappointed" to hear about the NAACP warning. "We fly over borders, walls and stereotypes to connect people from different races, religions, nationalities, economic backgrounds and sexual orientations," Parker wrote in the memo, which the company released to reporters. "We do not and will not tolerate discrimination of any kind." He said the airline has reached out to the NAACP to meet with them. NAACP President Derrick Johnson had called for a meeting with the airline's leadership. That woman, Tamika Mallory, said she had gotten into a heated exchange earlier this month with a gate attendant at the Miami airport who she described as "very disrespectful" and "very dismissive." Mallory said she told the attendant that she would file a report about the incident. Mallory, a civil rights activist and the co-chair of the Women's March on Washington, said the pilot of the aircraft, a white man, witnessed the end of the encounter and pulled her aside. "The first words to come out the pilot's mouth to me are, 'Respect is a two-way street,'" she said, adding that he asked her whether she could behave herself on the flight. "He looks at me and points and says, 'Yeah, her. Off.'" "Some of them are actually friends of mine," Mallory said. She added they "have felt that there is a level of aggression in terms of how people, particularly black women, are being handled on these flights." And on a different occasion, on a flight from Washington, D.C., to Raleigh-Durham, North Carolina, a black man was forced to give up his seat after he "responded to disrespectful and discriminatory comments directed toward him by two unruly white passengers," according to the NAACP. Mallory said a meeting with American "is being worked on." She added that she hopes the company can be a potential leader in addressing these issues. "I think that the company has continuously put out statements about their commitment to diversity, and their commitment to treating all of their passengers the same," she said. "And I think that a statement is good. But if your personnel is not carrying out that vision, then there's a problem. And there has to be accountability mechanisms in place to ensure that if we see a pattern, that we've got to address it." Johnson said the NAACP's "growing list of incidents ... involves behavior that cannot be dismissed as normal or random." In August, the organization issued a travel advisory for Missouri, citing several discriminatory incidents in the state as reasons for individual visitors to travel with "extreme caution."